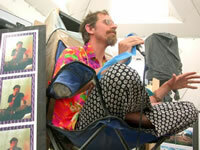 A talk by Erik Davis at Burning Man 2003. Posted in Burning Man, Culture, Erik Davis, Evolution, Palenque Norte and tagged Burning Man, Culture, Erik Davis, Evolution, Palenque Norte. Hey, just wanted to know… Where did take place that intervention ? It is written “at BM”. Is it really the case ? I found the article in Afterburn really intersting, wanted to know his genesis and if E.Davis had written other things about BM, and maybe could discuss with him.